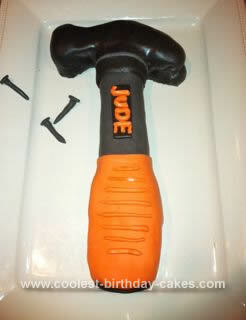 My son Jude absolutely loves loves loves HAMMERS, so for his 4th birthday I surprised him by making him a hammer birthday cake. I used homemade cake, butter cream, and fondant and used a Black and Decker toy hammer as a guide. It was a lot of fun and he was definitely surprised. I used black food coloring to make the gray and black fondant and even sculpted a few nails.